Golf has changed a lot over the years and like many other sports, technology has completely redefined the way the game is played and experienced for better. For golfers that need help to train and learn to keep their head steady during the golf swings, there are apps that could help with that. Among so many sports apps, choosing the best golf app for training is hard. 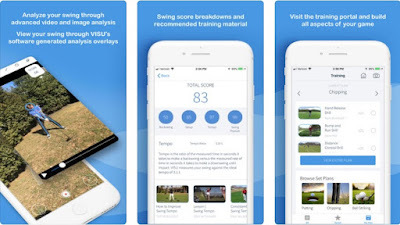 We searched and discovered a great golf app you need to try to improve your golf swings. What is VISU all about? VISU is developed for iOS users, designed for all golf players that need help to improve their golf swing and their game completely. With the help of this sports golf app, you will get the power of the most expensive golf equipment within your phone’s simplicity. The app will do complex and robust analysis of your golf swing and will measure metrics like your tempo, head movement, and spine angle. More than that, the app will also recommend the training material you need based on your swings, helping you improve it fast. With the help of this golf swing analyzer, the golf players get the chance to improve their swings and overall their game with the most efficient features offered for them. Your swings are stored in the Swing Library, in one place where also all your scores, the cub you used and the time the video is taken are shown as well. Record easily videos, choosing by preference the normal or slow-motion video recording! Your videos can be also edited and previewed, you can draw lines and circles over your video to help you in your analysis. The VISU’s software generated key-points can be generated with your swing analysis overlays and you can use the training portal like a consolidated and organized platform of training material to add and complete your lesson plans, progressing in all aspects of your game. View rankings as a user to see how you stack up against others in the profile dashboard and collect badges so you can showcase your golfing progress and dedication. Download it now for free on the App Store to analyze your body through golf swings and measure metrics!